Coffee Cake was a very pleasant surprise, bringing together Bran, a young man whose position on that sliding scale of sexuality is certainly atypical, and Malachi, a high maintenance extrovert who seems prone to random mishaps. Bran and Malachi are as unlikely a pairing as you could imagine, but Bran's quiet demeanor and extraordinary patience are more than a match for the quixotic Malachi. There's mystery, a path to self-discovery, and enough tense moments to keep you riveted to the story. I would fault the plot on having a bit too much repetition, with Malachi acting out (passive-aggressively) and doing all he can to drive Bran away, with scenes set in the same location and some questionable motivations by some of the minor characters. 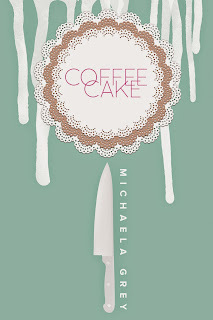 But beyond that, Coffee Cake is a quick, engrossing story, ending on a high note. This is a solid four star read. Blurb: Bran Kendrick never expected to fall in love. Heâs asexual, after all. What chance does he have of finding someone whoâll see past that? So when Malachi Warren catches his eye, Bran tells himself his crush will pass. Malachi disagrees. He has been attracted to Bran for some time, something he is delighted to find Bran reciprocating. They begin to date and feel their way through an intimate relationship that meets both their needs. Suddenly Bran finds himself juggling a new boyfriend, a demanding job, and a college degree heâs not sure he wants, but he couldnât be happierâuntil a series of seemingly random accidents befall Malachi. When they escalate, Bran realizes someone is trying to take away the best thing that ever happened to him, and he must scramble to keep Malachi safe while they search for the would-be killer. EVEN IN early September, Vermont meant that Saturday morning dawned crisp and cool, and Bran tugged on his favorite beanie and scarf before making the trek across campus to the Grind, the tiny coffee shop that was his main source of income. He couldnât help the smile that flickered across his face when he walked into the kitchen, breathing in the smells of bread, cinnamon, almonds, and toasted sugar. He could feel the tension draining from his shoulders as he mentally flipped through the list of things he needed to do before he opened the cafÃ©. Start the blueberry muffins first. They can bake while I put together the topping for the coffee cake. Sweet-talk the cappuccino maker into starting up and leave yet another note for Naomi about getting a new one. Put the croissants in the oven last; I really need to set aside a couple of days to perfect making those myself so I can actually recommend them with a clear conscience. Call Katie and find out where the hell she is and why Iâm here alone again. He spent the morning making cappuccinos, espressos, and Americanos for the students who straggled in, bleary-eyed and hungover from the night before. He knew a lot of themâit wasnât a large college, after allâand he dispensed smiles and the occasional aspirin along with the blueberry muffins and croissants. When the bell jingled midmorning, Bran was in the back. He was handling the store alone, since Katie had phoned in sick. âBe right there!â he called. He tugged a tray of muffin batter out of the massive refrigerator and slid it into the industrial-size oven before wiping his hands on his apron and hurrying back into the storefront. Only to slam on the brakes and stare at Malachi leaning against the counter, smiling at him. âSure,â Bran said, and he moved to obey, mind whirling. Malachi leaned on the counter and watched him, and Bran still couldnât figure out what to say. âDid you go to any good parties last night?â Malachi asked, and Bran jumped. âI, uh, no,â Bran said, cursing his fumbling tongue. âHad to study. I donâtâ¦ party much.â And there goes any chance of Malachi wanting to get to know me, he thought a little despairingly. âYou should talk to Dave,â Bran said, and then he wanted to kick himself. Why hadnât he volunteered himself? He could study with a senior, couldnât he? Bran did drop the coffee cake that time, and stood there staring at the mess on the floor for way too long. Idiot. He went to his knees and began picking up shards of pottery. âYou okay down there?â Malachi asked. âFine,â Bran said, and then he gasped as he sliced his hand on a sharp edge, blood welling up and then dripping onto the mangled coffee cake on the floor. Malachi rounded the counter and pushed Bran away from the wreckage, gripping his wrist. âYou idiot, what were you thinking?â His voice was warm with concern, and Bran couldnât think of anything but how gentle Malachiâs hand was on his skin. Malachi reached up, grabbed a clean towel from the counter, and wrapped it around Branâs hand with deft movements. Then he stood up. âStay there,â he told him, and disappeared. Bran obeyed, resting his head against the cabinet. Dimly, he heard Malachiâs voice and the jingle of the coffee shop door. Silence fell. That was that, then. Bran sighed. He was a klutz, and heâd scared off the cutest boy heâd ever seen by being a fumbling idiot who didnât know how to talk to people like a normal person. He nearly jumped out of his skin when Malachi appeared above him again. âWhoa, hey, easy there!â Malachi said, grabbing his shoulder. âIâ¦ thought you left,â Bran said, then wanted to kick himself. âNah, I closed the shop. Kicked out the few people savoring their muffins and locked the doors behind âem. Weâve got the place to ourselves. Now get up, câmon, we need to clean that wound and bandage it properly.â He steadied Bran by the arm as he levered himself to his feet, holding the red-soaked towel aloft with a grimace. âNot feeling faint from blood loss, are you?â Malachi asked, steering him toward the back. Bran shook his head. He was light-headed but it wasnât blood loss. It was the firm hand that held his arm, steadying him as he led Bran to the bathroom, and the concern in those bright brown eyes. Malachi opened the bathroom door and tugged Bran inside. It was a tiny room, and Bran held his breath at his proximity to the other young man. Malachi turned on the sink and unwrapped the towel with careful fingers. Bran hissed as it pulled at the edges of the gash, and Malachi winced. âUnder the sink,â Bran managed through his teeth. Malachi fumbled for it one-handed, his soft hair brushing Branâs arm as he bent down, and Bran swallowed hard. Malachi came up triumphantly with the kit clutched in his fist and set it on the edge of the sink. After turning off the faucet, he gave Bran a gentle push toward the closed toilet lid. Bran huffed a laugh and sat down. âAre you a trained medical professional?â he teased, and Malachi grinned at him. Branâs head swam at the thought of having that long with Malachi, of being in a car with him, having his attention, but he shook his head regretfully. Bran blinked. Was Malachiâ¦ flirting with him? He fumbled for something to say, something witty, something that would make Malachi laugh, but then the moment passed, and Malachi was standing back to admire his handiwork. âIâm notâ¦ interested in girls,â Bran mumbled, ducking his head. âWhat, like threesomes?â Bran said, then nearly clapped his hand over his mouth. âIâm not gay either,â Bran blurted. He wanted to run, to hide and never look at the young man standing in front of him, but at the same time a weird feeling of relief was stealing over him. Malachi was the first person heâd told. Come what may, heâd admitted to someone what he was, and that was a step forward, no matter how Malachi reacted. Malachi was utterly still above him, and Bran swallowed hard. This was it, the part where Malachi told him to have a nice life and took off back to his normal friends. Malachi tilted Branâs chin up, and Branâs eyes widened as he met his gaze. âI, uhâ¦.â Bran floundered for words. Bran stared at him. When had they agreed to that? âIn the meantime, you have a coffee shop to run, so letâs get you back to it, shall we?â He flapped his hands at him until Bran took the hint and stood up, feeling a mile tall as he towered over the shorter man. Malachi just tilted his head back and grinned up at him. Then he shooed him out of the bathroom and back into the store, where he grabbed a chair from the dining area and dragged it behind the counter. Bran just stared at him as Malachi grabbed the dustpan and began cleaning up the coffee cake mess on the floor. Malachi whistled as he cleaned and then opened the front door, and Bran stayed quiet and watched him, head swimming. Malachi hadnât run. He hadnât disappeared when Bran had told him what he was. Why not? Bran was different, not normal. Malachi couldnât possibly be interested in Bran, so why was he still hanging around? Malachi snapped his fingers, and Bran blinked, looking up. He disappeared, and Bran stood up to take the first customerâs order with a smile on his face. When sheâs not writing, sheâs knitting while watching TV or avoiding responsibilities on Tumblr, where she shamelessly ogles pretty people and tries to keep her cat off the keyboard. Get a chance to win a signed paperback copy of Coffee Cake!